I have read Bomb and Notorious Benedict Arnold by Steve Sheinkin and I love his writing. His nonfiction reads like thrillers you pick up and read in one night; you keep turning the pages- holding your breath and hang on the edge with each turn of the page. 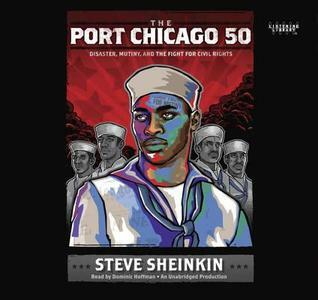 In Port Chicago 50, Sheinkin's research is thorough, and even though it seems words and phrases are repeated...it is pivotal to drive home the unequal, horrible treatment these young African Americans received as sailors for the Navy. No one would listen as the discrimination and degradation continued. No one would listen when these boys were not trained to handle dangerous ammunition. And no one believed them when they said officers placed bets on which divisions could load the most ammunition the fastest. What Sheinkin shows in this must read book is the continued injustice and mistreatment by the Navy, even after the horrible explosion that claimed so many lives and caused fear in those that survived. Even with Thurgood Marshall involved, the trial was a sham with lies and bias by the white officers, prosecutor and the members of the Court toward the 50 young sailors. Highly recommended for students and adults. Sign into Goodreads to see if any of your friends have read The Port Chicago 50.